There is a certain allure when undescribed plants are discovered in the herbarium or museum. Many have experienced the moment when they looked at a preserved specimen and thought, “Oh, if only I had this fresh” or “If only I had seen the habitat.” Imagine the excitement when it was first realized that the Metasequoia, known only from fossil specimens, was found living in China. Imagine what hope and anxiety was expressed when seeds arrived at Harvard’s Arnold Arboretum for propagation. 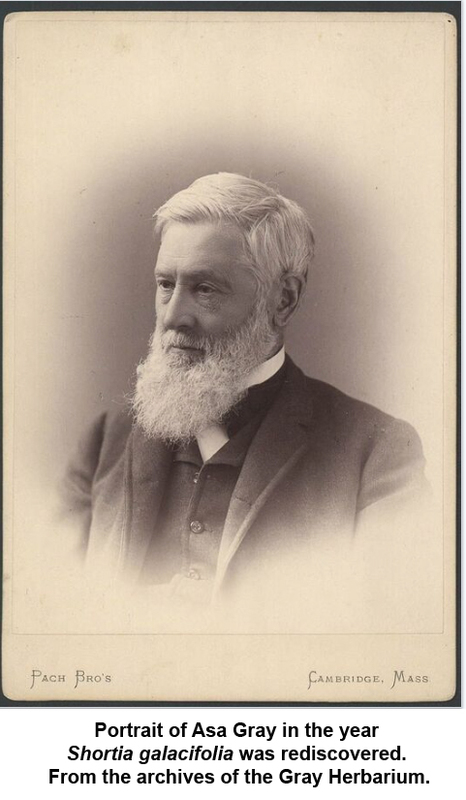 One of the best documented examples of discovery in the herbarium occurred when, in 1839, Asa Gray, newly appointed professor at the University of Michigan, came across a North American plant in the Paris herbarium which he had never seen and which seemed special. Though it was in fruit but not in flower, he still realized that this plant, collected by André Michaux nearly 50 years before, deserved a genus of its own. It was filed as an unknown among the collections. Michaux was in North America from 1785 to 1796 and had ranged from Quebec to the Bahamas traversing much of the eastern part of the continent. The plant in question was collected in North Carolina and was recorded by Michaux as coming from the high mountains (“Hautes montagnes de Carolinie”). Gray had been working with John Torrey on A Flora of North America and his purpose in visiting Europe was in large part to study the plants in herbaria that represented the known flora of the North American continent. As stated by his biographer, Hunter Dupree, “Gray’s objective was, first, to wrest from Europe control of the source material of North American plants by resolving disputed points of nomenclature and establishing the Flora as the authoritative base for future work.” Because Michaux had collected copiously and broadly his herbarium was a primary focus of Gray’s study. In the Gray Herbarium Library there is a copy of Michaux’s Flora boreali-americana, annotated by Gray in Paris when examining the Michaux material. In it one finds the details of his findings. In North America Michaux had made his base Charleston, SC, where he established a botanical garden. The garden became the headquarters from which he collected extensively. In late 1788 he was at or near the headwaters of the Keowee River when he collected the plant that Gray puzzled over. The plant came to be named Shortia galacifolia, in a footnote, in 1842 by which time Gray had been appointed to a position at Harvard. Charles Short, the namesake of the genus, was a Kentucky botanist, who was much admired by Gray. The specimen received by Gray from M. E. Hyams. The first material Gray saw in flower. The drawing is by Isaac Sprague. From the Gray Herbarium, Harvard University Herbaria. Gray desperately wanted to see this plant in flower and alive. When he returned to North America in June 1841 he set out to find the plant. He traveled in the company of John Carey and James Constable. Taking the location that had been found with the Michaux specimen, “Hautes montagnes de Carolinie,” they set off to the high mountains. They visited many of the locations Michaux visited. 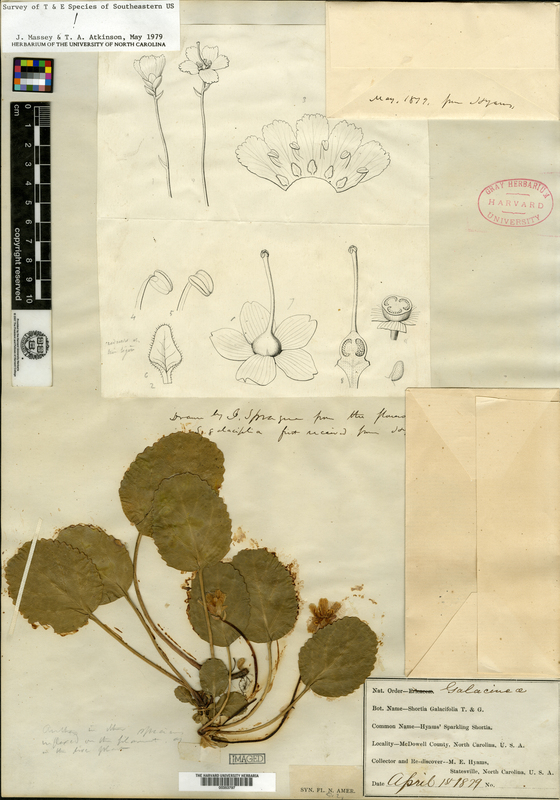 A search of the herbarium informs us that they collected broadly across plant groups, including mosses, but Shortia galacifolia remained known from a single imperfect specimen. 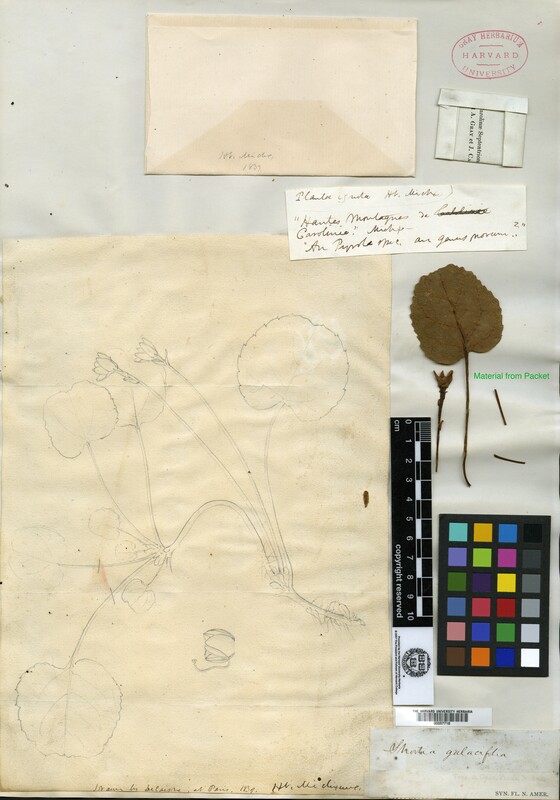 Gray had brought fragments back from Paris, several leaves and a flower stalk, with notes and a drawing that had been made by his colleague in Paris, Joseph Decaisne (1807 – 1882). These where part of Gray’s growing herbarium but they were only fragments of what seemed to Gray to be a lost plant. Gray tried again. He and botanist and bryologist William Starling Sullivant visited these same regions in 1843 but were unsuccessful so far as their quest for Shortia galacifolia. As the United States expanded and as Gray’s network of collectors spread out he assigned this part of the continent to his own charge. The rich and varied flora of the southeast remained a focus for Gray throughout his life. 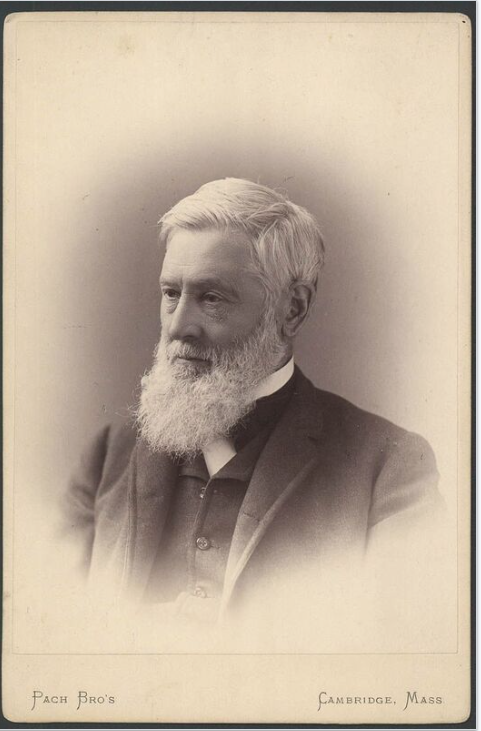 The final episode in this story of discovery involved Charles Sargent, founder of the Arnold Arboretum at Harvard. In 1886 Sargent was searching in North Carolina for a Magnolia that Michaux had mentioned. He was using Michaux’s diary entries for directions. With this he stumbled upon the very place where Michaux had originally collected S. galacifolia. A misreading of the diary had led to decades of distraction. Sargent was able to deliver a living plant to Gray and Gray rejoiced. It had been a quest that carried through most all of his life. It seems it was grown in the Harvard Botanical Garden in Cambridge although we have no specimen to document this. Dupree cites an interview with L. H. Bailey in saying, “When at last it bloomed in the garden he caressed it with real feeling.” Isaac Sprague illustrated it in The wild flowers of America, the first part of which was published in 1876. This is certainly the first color illustration of S. galacifolia. The illustration was accompanied by text written by George Lincoln Goodale, Harvard Professor and student of Gray. Goodale recounts the history of the genus and its rediscovery. Of the search he says it was “the plant so long sought and by many so long doubted.” By 1903 S. galacifolia was being grown in the Dresden Botanic Garden, Germany where Rudolph Blaschka obtained material to model the plant for the Ware Collection of Glass Plants at Harvard University where it can be seen today. A specimen in the Gray Herbarium attests to its presence in a rock garden in Newburyport, Massachusetts in 1921. The HUH has a wide sampling of S. galacifolia from the US southeast and specimens later collected and described from Asia. A search in the herbarium reveals the evidence of Gray’s undertaking. There is the fragment from Paris mentioned above, there are collections from across the range of this species. The 1879 collection made by George Hyams, sent by his father M. E. Hyams, documents Gray’s eureka moment when he saw his plant again and felt vindicated in his bold youthful decision to publish this as a member of a new genus. From studying these collections and others we can formulate distribution patterns both in North America and in Asia where the other species are located. A fragment and drawing of the original Michaux specimen. The notations are in Gray’s hand. This was brought from the Paris Herbarium by Gray and is in the Gray Herbarium, Harvard University Herbaria. When we work with collections we learn history, we learn something about human nature, and we learn about the world we live in. Imagine the several miserable days in December 1788 spent by Michaux when he collected the specimen in North Carolina. It was cold and raining and he took refuge in a leaky cabin with locals and dogs. Gray carried his quest for this plant for most of his life. How could he remain so curious about that which is had already studied? And the herbarium lets us look at the geographical range of the one North American species and those five in Asia that bear on the discussion Gray’s biogeographical hypothesis on the connections between the floras of Eastern North America and Eastern Asia. Interestingly, the Asian Shortias were published after Gray’s insightful biogeographical work. These trips to the Carolinas were among the few extended field expeditions that Gray made. The man who described much of the Californian flora did not cross the Mississippi until late in life. From the start of his career Gray’s life was bound by responsibilities. 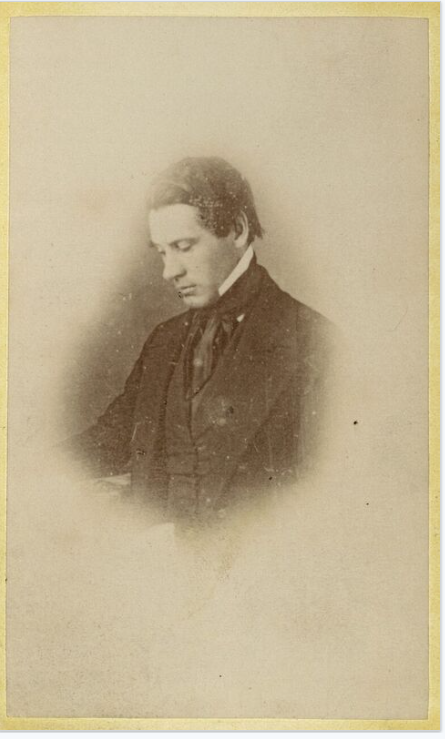 He was selected as botanist for the United States Exploring Expedition but took a position at the University of Michigan and then went to Europe. He traveled for the University and was charged with buy books and assembled materials for teaching but he took advantage of the major herbaria in Europe to further his work with Torrey on the North American flora. Back home he was offered a position at Harvard University to teach and to manage the Botanical Garden in Cambridge. There he was tied by academic and administrative duties but his work was at the center of a botanical enterprise that brought the world to him. As the western parts of North America were explored and surveyed his trained collectors were on the spot gathering plants to ship back to Cambridge. The political turmoil that surrounded the United States Exploring Expedition brought the irony that Gray, who did not go on the expedition, was called upon to describe those collections from the Far East and south Pacific. The specimens from the United States North Pacific Exploring Expedition (1853-1856), including extensive collections from Japan made by Charles Wright, were his to work over and it was these temperate eastern Asian specimens that led him to his explanation of the similarities of flora or eastern Asia and eastern North America. He saw Cuba, Mexico and Venezuela from his desk in Cambridge. He was a closet botanist but what a view of the world he had from the Garden House in Cambridge. A note on sources: There are few cases of a plant search that are as well documented as the search for Shortia galacifolia. Of particular usefulness in explaining the 1879 trip is the diary of J. H. Redfield that was published as “In search of Shortia with Asa Gray in North Carolina 1879.” “Asa Gray and his Quest for Shortia galacifolia” by Charles F. Jenkins published in Arnoldia 2: 18-28. 1946. David Tabler summarizes events in The Long Trail of Shortia in Appalachian History. This last piece includes some notes on the Gray – Darwin correspondence that indicates a larger role for S. galacifolia in the formulation of Gray’s biogeographical hypothesis than can be warranted considering the descriptions of the Asian Shortias occurred after Gray had published his initial biogeographical work. The biography by A. Hunter Dupree, Asa Gray, 1810-1888, is a masterful work that places Gray in the center of scientific developments of the 18th Century.